På vår gård har vi dette nye luksuriøse private huset. Det er behagelig for fire til seks gjester, perfekt egnet for familier og venner. Du har hele huset for deg selv. Det er en god base hvis du har tenkt å utforske Sør-Island. To soverom begge med to enkeltsenger og en komfortabel sovesofa. Vi ligger 10 min kjøring fra byen Hella (på rute 1) eller 20 min kjøring fra byen Selfoss hvis du kjører fra vest (Reykjavik) I Hella og Selfoss finner du restauranter, svømmestikk, butikker etc. Landvegamót (bensinstasjon, butikk) er bare 3 min kjøring, og det er der du slår av rut en for å komme til gården vår. Hestheimar (Hestutleie) er 3 min kjøring. Golden Circle og Landmannalaugar 1,5 timers kjøretur. Seljalandsfoss 30 min kjøring. Hekla Volcano 1 times kjøring. Skógafoss 45 min kjøring. Vík 1 times kjøring. Selfoss 25 min kjøring. The villa was beautiful, lots of space and cozy. It’s about 15 minutes from Hella and about an hour away from the golden circle attractions. Adorable pup and cat that greet you each day as well. The house had everything we needed- oven, stove, washer, dryer, microwave, and hair dryer. I highly recommend this rental! Very clean, highly finished and very well equipped. The staff are very friendly too. The accomodation is fantastic, a modern property set on a lovely farm. We were two families (four adults and two toddlers) and the house was far more spacious than the photos appear. The house had everything you would need. Klara was very welcoming and took us all to see the animals which the children loved, they wouldnt stop talking about the horses. I would definitely recommend staying here as a great self catering option and just to enjoy the peaceful surroundings. We wish we could have stayed longer! This house was perfect for our first visit to Iceland and welcoming for three generations of our family. Its location along the south shore gave us a central spot to explore some of the beautiful Icelandic landscape, and the house was a warm respite during some cool and rainy weather. Klara was responsive during our inquiries, and the house is modern, well equipped, and very comfortable. Our 10-year-old granddaughter especially enjoyed feeding the young lambs and playing with the friendly dog and cat. 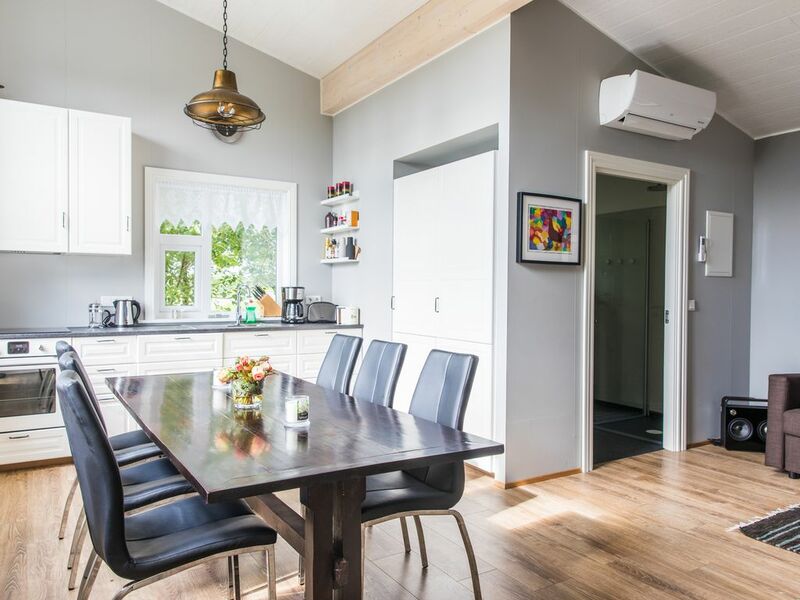 The property is a good choice for families visiting Iceland. Really nice modern villa just a few minutes from Hella. Has all the amenities you need. Very peaceful. My daughter loved feeding the animals and playing with the owners dog. The host is warm and was flexible with our requests. We loved staying at this home! Great place to hang out in case it is cold, rainy and windy. First time I played chess with my son in years. I lost.